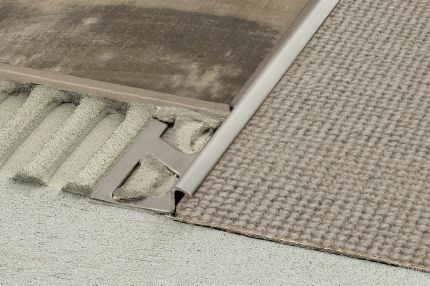 Schluter®-RENO-V is designed to protect tile edges and provide a smooth transition between tile coverings and floor coverings at lower elevations. Schluter®-RENO-V is designed to provide a smooth transition between tile coverings and floor coverings at lower elevations. The profile is available in anodized aluminum. RENO-V features a trapezoid-perforated anchoring leg, which is secured in the mortar bond coat beneath the tile, and a movable transition arm that allows the profile to adjust to the height of the adjacent floor covering via a balland- socket joint. 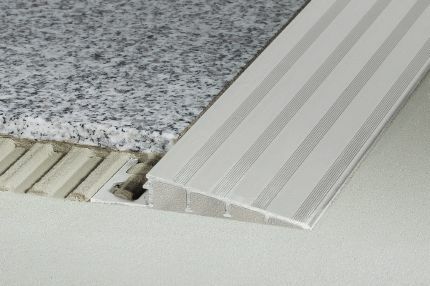 The profile protects tile edges and provides a sloped surface to eliminate trip hazards. RENO-V features an integrated joint spacer that establishes a defined joint cavity between the tile and the profile. RENO-V is also suitable for heavy-duty applications (e.g., entrances to garages or loading docks). In such cases, the adjustable arm is backfilled with mortar. 1. Select the profile according to tile thickness and format. 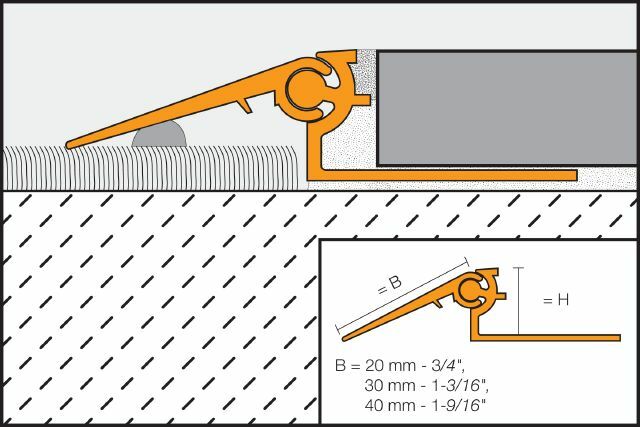 1b) When RENO-V is used in heavy-duty applications; fill the cavity beneath the sloped section of the profile with thin-set mortar. 2. Using a notched trowel, apply thin-set mortar to the area where the profile is to be placed. 3. Press the perforated anchoring leg of the profile into the mortar and align. 4. Trowel additional thin-set mortar over the perforated anchoring leg to ensure full coverage and support of the tile edges. 5. Solidly embed the tiles so that the tiled surface is flush with the top of the profile; the profile should not be higher than the tiled surface, but rather up to approx. 1/32" (1 mm) lower. 6. Set the tile to the integrated joint spacer, which ensures a uniform joint of 1/16" - 1/8" (1.5 - 3 mm). With the stainless steel profiles, leave a space of approximately 1/16" - 1/8" (1.5 - 3 mm). 7. Fill the joint completely with grout or setting material. 8. Remove grout or mortar residue from the visible surface of the profile. 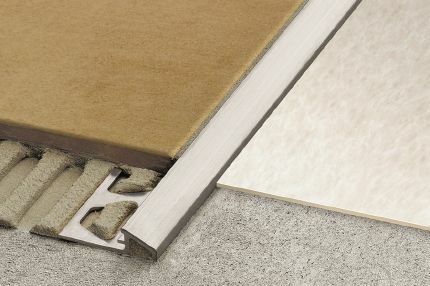 The Schluter®-RENO-V profile requires no special maintenance or care and is resistant to mold and fungi. Clean profiles using common household cleaning agents. Oxidation films on aluminum may be removed with a common polishing agent, but will form again. In the case of anodized aluminum, do not use abrasive cleaning agents.